PEM® brand fasteners utilize self-clinching, broaching, flaring, surface mount, or weld technology to provide strong, reusable, and permanent threads and mounting points in thin sheetmetal or P.C. board materials and other ductile or non-ductile thin material. PEM® brand fasteners utilize self-clinching, broaching, flaring, surface mount, or weld technology to provide strong, reusable, and permanent threads and mounting points in thin sheetmetal, P.C. board materials, and other ductile or non-ductile thin material. Design leadership and engineering expertise are the cornerstones of PennEngineering®. These disciplines mirror that of the transportation industry where technical advances and product integration are the rule rather than the exception. At PennEngineering, we understand those rules as we continue to foster partnerships, bringing solutions that fit into the designed-for-assembly and-manufacturability (DFMA) methodology. If a standard cataloged item will not work for you, then we will work with you to design one that can. See some examples below. The newest PEM® SpotFast® fastener permanently joins metal sheets to PC boards or plastic panels and creates a flush-attachment connection without protrusions on either side. 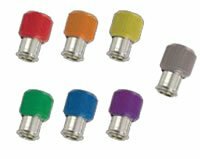 Penn Engineering® is proud to announce the release of this colored cap expansion of the PEM® type PF11PM Panel Fastener line.